unemployment and other storm-related legal issues. 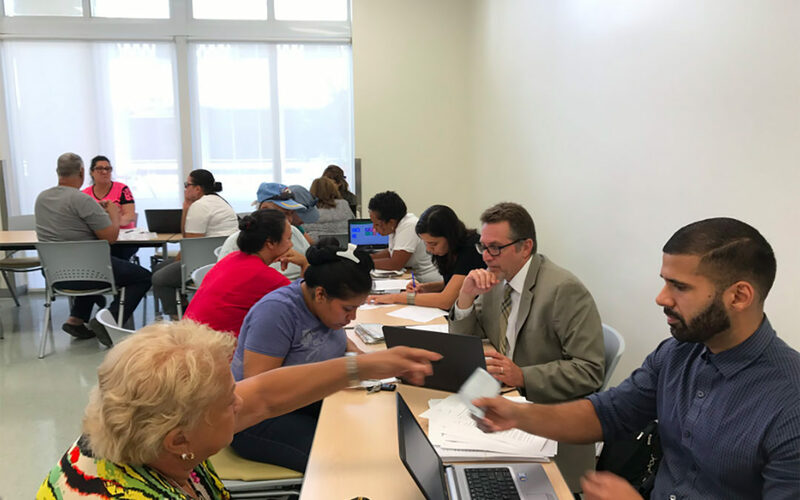 “We were glad to join forces with Legal Services of Greater Miami and be able to help many individuals successfully negotiate the complex process for receiving much needed assistance,” stated Lesley Mendoza, Executive Director of CABA Pro Bono Legal Services. CABA Pro Bono and Legal Services of Greater Miami, Inc. worked closely with local elected officials to assist those in the hardest hit neighborhoods and who are still having trouble recuperating in the aftermath. A total of 371 clients were served at the six clinics organized in Little Havana, Liberty City, Big Pine Key, Hialeah, Doral, and Marathon. Organizers and volunteers for the clinic in Doral opened their doors early for Miami-Dade residents who began lining up outside the location where the clinic was hosted. Thanks to the combined efforts of CABA Pro Bono, Legal Services of Greater Miami, Inc., and local elected officials, that clinic alone serviced 147 clients in a short time. In cooperation with the clinics was assistance from U.S. Sen. Marco Rubio, State Sen. Rene Garcia, State Sen. Anitere Flores, U.S. Rep. Carlos Curbelo, U.S. Rep. Mario Díaz-Balart, State Rep. Bryan Avila, State Rep. Manny Diaz, Jr., State Rep. Holly Raschein, State Rep. Jeanette Nuñez, Mayor Carlos Hernandez, Commissioner Bruno A. Barreiro, Commissioner Rebeca Sosa, and Chairman Esteban Bovo. CABA Pro Bono Legal Services prides itself in helping to change the lives of children, individuals and families in need through legal advocacy by providing free legal services to those who could not otherwise afford it — regardless of race, creed, color, gender, sexual orientation or national origin.